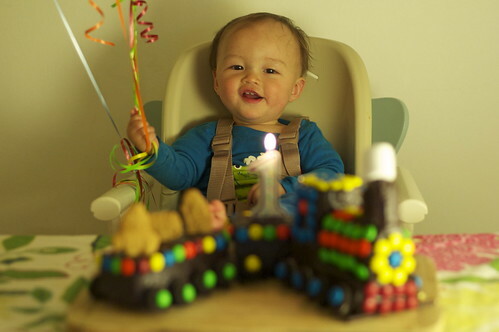 On the first anniversary of his birth2, we had some train cake and lots of singing of Happy Birthday over Skype with first his GrandDad in Scotland, then PoPo and GongGong in Singapore. Kid’s growing up thinking his grandparents live in the laptop. 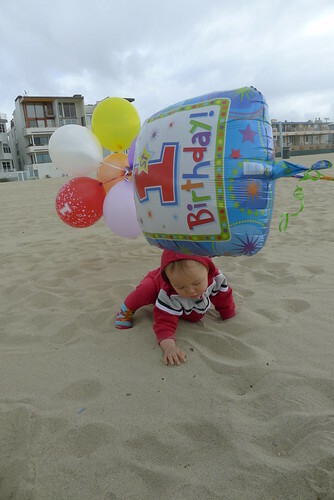 To celebrate, we had a big bash with beach balls, butterfly cakes and balloons on the beach3. As with all outdoor parties, especially in February, it could have been a wash-out. The day started cold and gray. 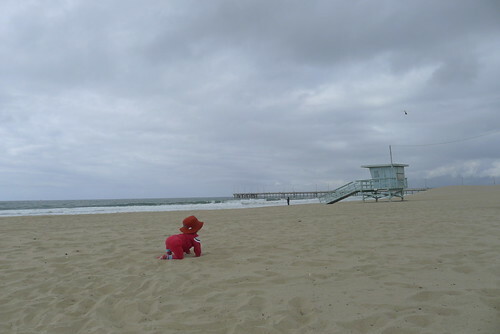 There was a lone baby in red playing in the sand on his own. The party guests were nowhere in sight. 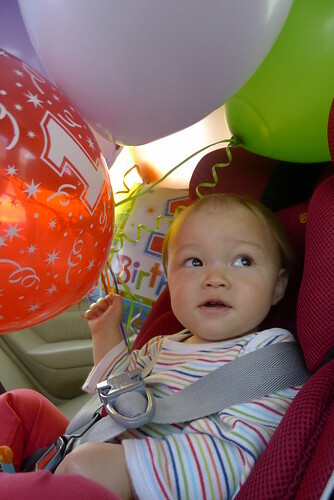 At one point, a little girl and her mother came by to check out our balloons and chat, and I very nearly invited complete strangers4 to Fin’s birthday because I thought no one would show5. But the sun came out, our friends came (we all live on LA time or have kids; same effect), and we had a great time doing birthday-y, beachy and nerdy things together! 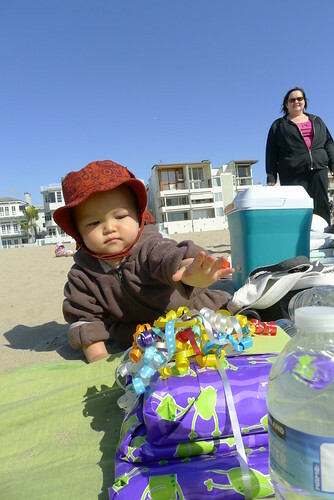 Sometimes we feel really guilty for having Fin so far away from his grandparents, aunts, uncles, cousins. 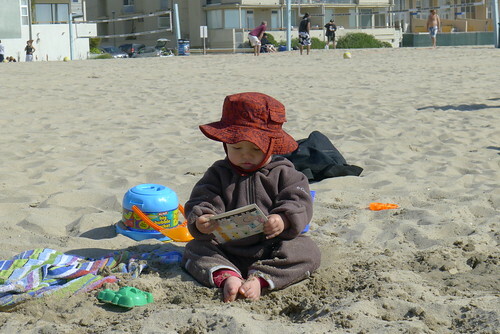 But to make up for it, we have wonderful friends and colleagues in LA who act as substitute aunts and uncles, and their fabulous children are great playmates for Fin. Guess home is where you make it! Fin and nerd, photo by friend of nerd. 1 Well, he turned one in Feb, but I’m a slow blogger. Posts from 2008-2011 are still waiting to see light of day. Even glaciers move faster. 2 Henceforth referred to as birthday in keeping with convention even though it doesn’t make any sense to me since a birth-day can only happen once and thank bloody goodness for that! 3 And this constitutes our second monthly party of 2012 (see resolution no. 1). 4 They weren’t strictly strangers anymore since we chatted for a bit. 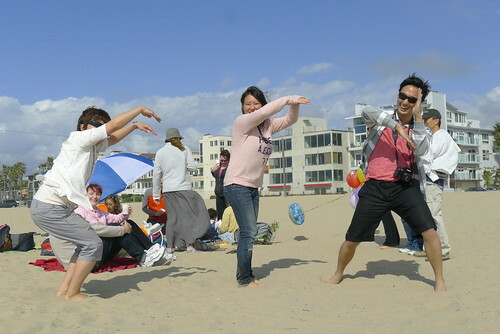 They were also most likely the smartest dressed folk I’ve ever seen on Venice Beach. I wished afterwards that I had asked them to stay for some cake if only to up our style quotient. 5 I wonder if Fin’s mother has deep-seated insecurities about being the class nerd whose birthday party was always under-subscribed compared to the cool kids, possibly because it was always during winter break. But her real friends always showed up, so everything worked out a-ok.
6 SCN, short for suprachiasmatic nucleus. My friends and I are nerds by profession. This is considered fun for us. 7 Baby is turning out just like his parents: human trash cans, the two of them! 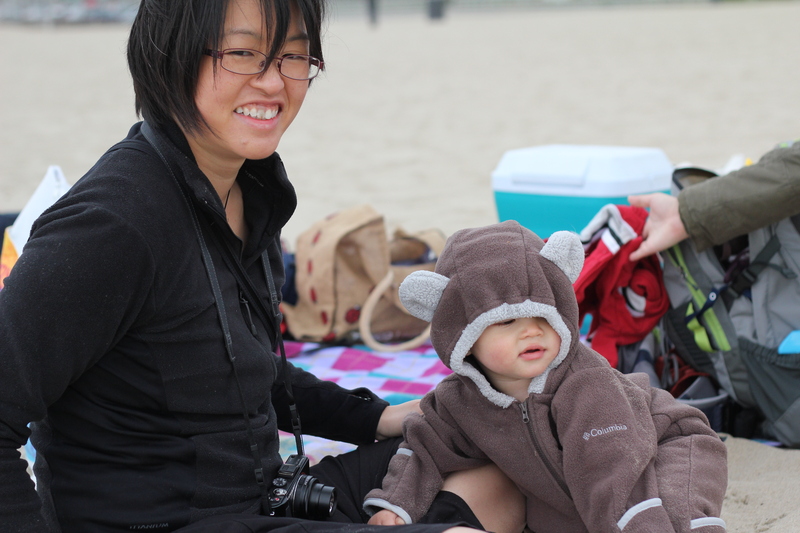 This entry was posted in akatsuki snaps and tagged baby, baby mushroom, gratuitous baby photo, venice beach. Bookmark the permalink. these happy photos made me grin.